What is the tuition fee in Vietnamese centers? To find further information regarding courses and tuition fees, please contact your local centers for such information. How do parents and Mathnasium centers relay information and concerns? Students’ highest achievements are best achieved through the collaboration of the family and Mathnasium employees. Every day, teachers will note each student’s progress in a Report Booklet. The consultants will provide support to the best of their ability in answering questions and advising parents. In addition, the Report booklet allows parents to make an appointment with the teacher when they need to discuss in person any concerns about their child’s studying. Parents can easily keep track of their child's progress through the three-step teaching process at Mathnasium: Step 1: Evaluate, Step 2: Educate, Step 3: Validate. At the midpoint and end of each course, students take On-going assessments, which have a similar format with the Pre-assessment, the results of both tests are compared to evaluate the learning progress of each student. 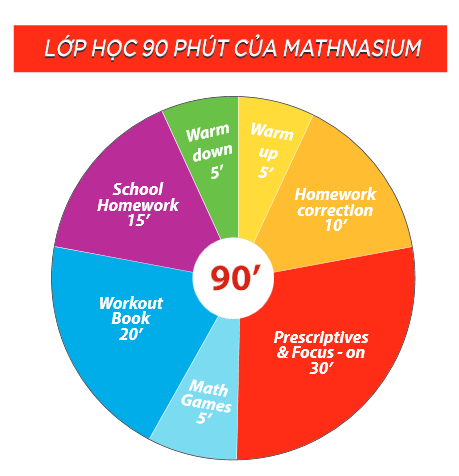 Do Mathnasium programs support the Vietnamese curriculum? Parents should be completely assured that the Mathnasium procedures not only follow but also build upon the Vietnamese curriculum. In addition to this, the system takes an orderly, logical approach to teaching math to the individual. Well trained teachers ensure each student become familiar with concepts such as fractions, time, charts, etc. As a student progresses in Mathnasium, it is assured that their improved skills will lead to higher results in Math at school. In addition to basic math problems, Mathnasium also supplements the course by adding international topics to the curriculum. What is the Mathnasium Method? Mathnasium applies a personalized approach. Each child is evaluated with written and verbal assessments that are unique to Mathnasium. Based on the assessment results, the center creates a custom program designed to help close educational gaps a student may have, and on the other hand with higher scores, the student moves forward as they are ready for more advanced math challenges. Mathnasium develops a method of teaching that uses a unique combination of mental, verbal, visual, tactile, and written techniques to help children learn math. These 5 techniques are integrated in order to help children understand math through honing their math instincts, and developing their critical thinking skills without traditional classroom pressure and boredom. How can Mathnasium method help my child? Truly understand and appreciate Math. Increase critical thinking and reasoning skills, creativity, and intelligence. Understand Math and gain better grades at school. Establish the habit of self-study and time management. How do students learn at Mathnasium centers? Mathnasium fosters a caring, encouraging environment that helps kids thrive and learn to vastly improve their potential. Teachers are experienced, specifically trained and tested to meet Mathnasium standards. They are tasked with implementing and individual learning plan and working with each student to ensure they master the materials. Who is the method for? Who are Mathnasium teachers? How are they trained to meet the global Mathnasium standards? For Preschool Teachers, Mathnasium requires a degree in pre-primary education. Primary and secondary teachers must have a degree in mathematics, mathematics and technology, or natural sciences with pedagogical certificate from a recognized college. Mathnasium teachers are recruited, trained, tested, and certified according to Mathnasium standards. While working at Mathnasium, their classes are regularly supervised and assessed by the quality management team. There are also continuing workshops and on-going training sessions for teachers to update information and improve their quality of teaching. Students are taught how to understand math in an individual setting. Our unique approach enables teachers to effectively explain math concepts and also lend a helping hand to every student. Each teacher is responsible for a group of only 6 students. Our teaching goal is to care for each individual student by helping them hone their math instincts. Based on the Pre-assessment’s results, each student will receive a customized learning plan designed to address each student's needs, which means that even though students study in a group, each of them will have their own materials in order to fill in any foundational gaps in their mathematical knowledge. How many levels are there in Mathnasium programs? How long does it take a student to go through all those levels? There are three programs in Mathnasium curriculum: Kindergarten, Primary and Secondary (for students from 4 to 15). All Mathnasium students start by taking a customized assessment which pinpoints their specific learning needs. The assessment’s results will be analyzed by specialized software, which is used by Mathnasium centers globally, in order to create a 6-12 month customized learning plan for teaching the concepts that each student needs to master. Assessments continue every 3 months to ensure the student’s progress. Upon completing a learning plan, students will take a Post-assessment and another Pre-assessment for the upper level.